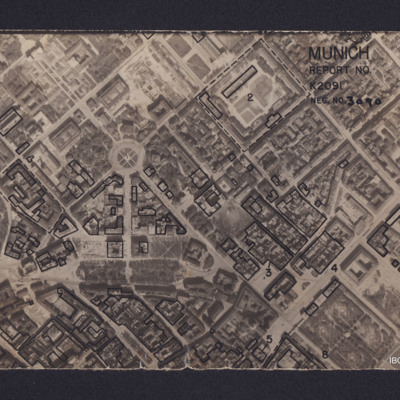 Recconaissance photograph of Munich. Some buildings have been marked and annotated with numbers. The Frauenkirche is visible in the bottom right corner. Captioned '3139 106W.216 3-5-44 F/36” // 540SQDN'. 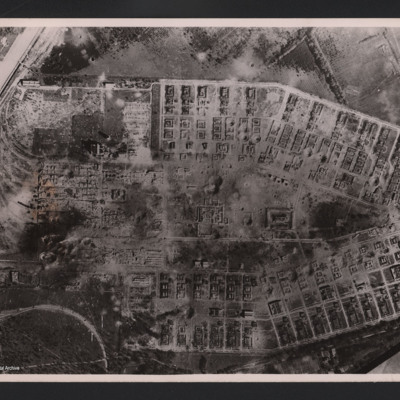 Reconnaissance photograph of Heligoland after bombing, with most buildings and port facilities destroyed and large plumes of smoke from fires. Additional information about these items was kindly provided by the donor. 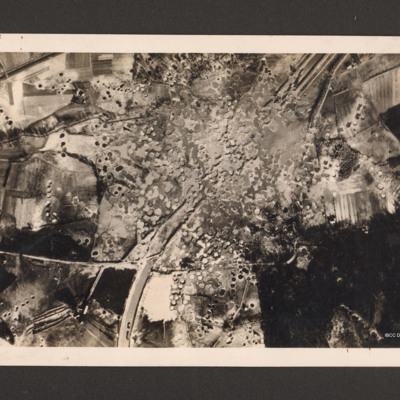 Vertical aerial photograph of an area showing severely destroyed buildings and large craters appearing throughout. A road is going through the middle of the buildings and the area is surrounded by fields, also covered with craters. 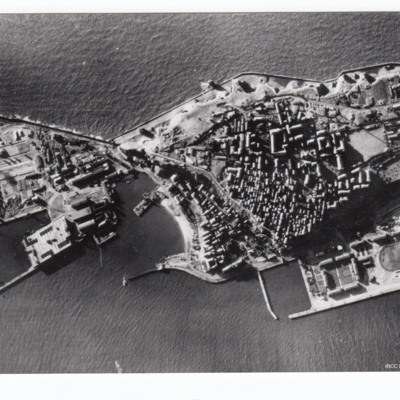 Reconnaissance photograph of Helgoland with port facilities visible. 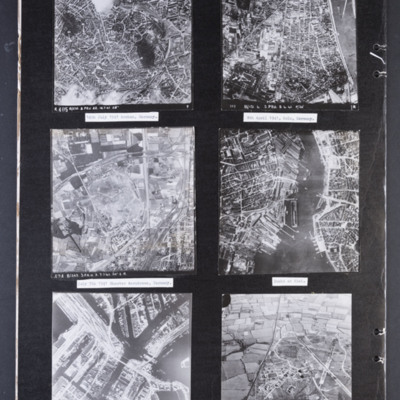 Vertical aerial photograph annotated 'Munich Report No K2091 Neg No 3090' and with a North arrow. Individual buildings are outlined in black. 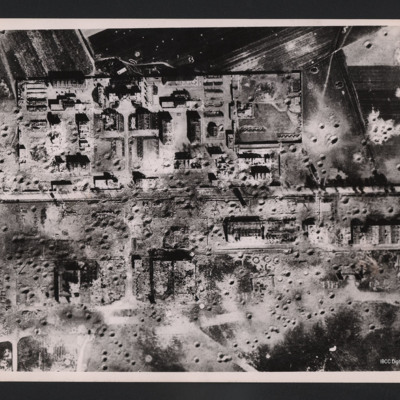 Oblique aerial of bomb damage to the Krupps workshops. Captioned 'Krupps Armament Works Essen 11-3-1945'. Aerial oblique of Cologne with the cathedral in the centre. Behind is the Rhine and a destroyed bridge. Many of the buildings are damaged. 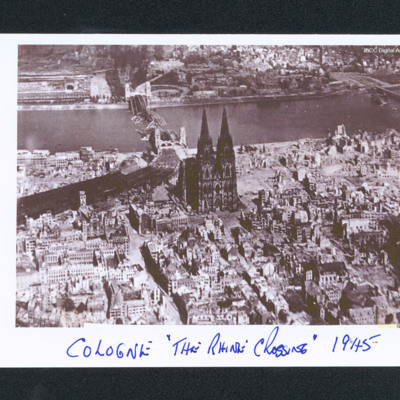 Captioned 'Cologne "The Rhine Crossing" 1945'. Oblique aerial of a damaged city. In the centre is a river and a low hill. In the distance are undamaged buildings. Captioned 'The city of Kleve in February 1945'. 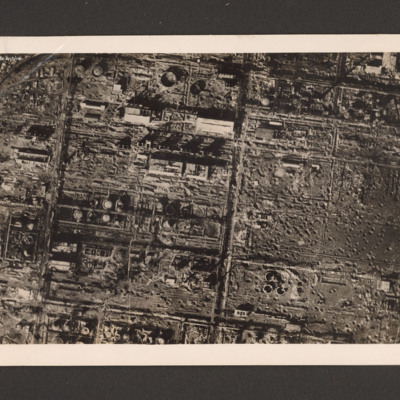 Vertical aerial photograph of bombed workshops. Most of the buildings are damaged.It is captioned 'Essen (Krupps)'. Oblique aerial photograph of a square dock area with several naval vessels. There are dry docks at the top. The majority of the workshop are undamaged. It is captioned 'Wilhemshaven' [sic]. 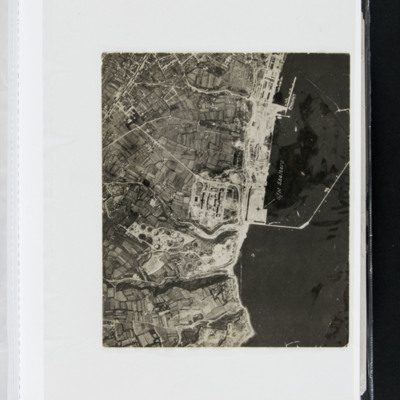 Vertical aerial photograph of a bombed harbour area near the the Visserhaven. The majority is damaged buildings. 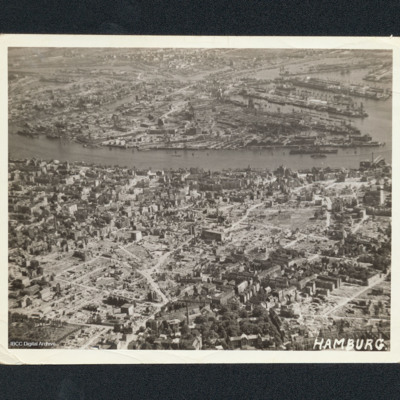 Oblique aerial photograph of Hamburg showing bombing damage. In the foreground are patches of trees and buildings that are not damaged. In the middle is the river and behind are the docks. Captioned 'Hamburg'.